Women training women is very important to us. We strive to encourage, educate and mentor women from the beginner to the advanced in the many different disciplines of the shooting sports. We offer a variety of classes to enhance our member's understanding and enjoyment of firearms and related subjects. 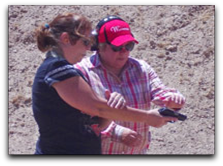 The Women on Target is the perfect introduction class for Ladies to understand the difference of semi-auto and revolvers. Getting to shoot many different guns is the climax of the class. Fun class with the girls from the office, Mother and Daughter, or just with friends. If you do not see a class scheduled your looking for let us know. All dates are subject to change without notice or cancelled due to weather. 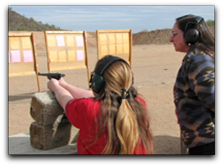 The course covers gun safety rules, different types of pistols, the basics of ammunition, fundamentals of pistol shooting, different shooting positions, the most common shooting errors, proper gun cleaning, which pistol is best for you, and how to maintain your skills. This class is a prerequisite for anyone wanting to become an NRA Pistol Instructor. Hey ladies come and join us for a fun day for women only to learn the basic skills for the shooting sports in a safe and supportive atmosphere. 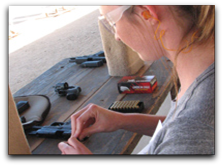 The course covers gun safety rules, different types of pistols, the basics of ammunition, fundamentals of pistol shooting, proper gun cleaning and how to maintain your skills. Registration includes eye & ear protection, targets, ammo and pistols. This course teaches essential knowledge to the safe and efficient use of a handgun for protection of self and family, and provides information on the law-abiding individual’s right to self-defense. 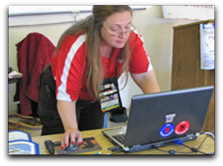 This is a four-hour non-shooting course for safe gun handling that is conducted in the classroom only. Students are taught NRA’s three rules for safe gun handling, primary causes of firearm accidents, firearm parts, how to unload certain action types, ammunition components, cleaning, care, safe storage of firearms/ammunition in the home, and the benefits of becoming an active participant in the shooting sports. Great class for a family. This course is designed to prepare experienced shooters for the basic duties of a Range Safety Officer (RSO). RSO’s supervise safe shooting activities, and ensure that the users of a range follow range regulations in order to reduce the potential for personal injury and property damage. RSO’s often have responsibilities to take immediate action when circumstances require it. The RSO is the range official on the firing line to ensure safety and to help shooters. This is an 8 hr class giving you a solid foundation for carrying a concealed weapon. We take no short cuts in your education making sure you understand Arizona Law. A brief review of safety and basic knowledge will lead into 4 hrs from the “Defensive Firearms use in Arizona Legal” by: Attorney Michael Anthony. The remainder of the time will be on the range with holster work, shot acquisition and what if situations. NRA’s Refuse To Be A Victim® program teaches the tips and techniques you need to be alerted to dangerous situations and to avoid becoming a victim. 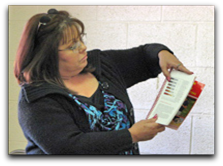 The Refuse To Be A Victim® program is not a firearms or self-defense class. It’s a seminar that will help you improve personal safety strategies and will provide you with valuable information that you can apply in every area of your life. To qualify as an NRA Instructor: Candidates must have completed the basic course in the discipline they wish to be certified to teach, e.g. NRA Basics of Pistol Shooting, NRA Basic Rifle Shooting, etc. 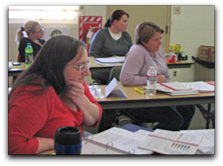 Instructor training courses are conducted by NRA Training Counselors. Private lessons are conducted at Ben Avery Shooting Facility. Please contact us for your scheduling needs. 4044 West Black Canyon Blvd.